There's so much to say about Bloop, the free art festival that it's almost difficult to know where to begin. The month-long festival runs from the middle of July to the middle of August each year and has been going strong since 2011. It brings together some of the world's best, most visual artists in a project that brings their ethos of “art is for everybody” completely and utterly to life. Each year the event has a different global theme that examines real life events and ways of living that apply to us all. This year's theme, “No Fear” examines the fears we all have and how our socially networked world is creating new ways of communicating without personal contact, leading to social anxiety or depression. It also looks at how the impact of how war and particularly terrorism, are creating more social fears and ultimately how we respond to them. The point here is to be provocative, to use art to help us understand the world in a more deconstructed way and remove ourselves from it for a moment. This year's exhibitions portraying violence against women or shots of the clashes in Syria and a controversial mural called “Funck the Power”, where a big hand points to a little hand giving orders - which has just been censored. This is mainly because the little hand was flicking the bird to the power hand and sadly Bloop wasn't given an opportunity to repond before the curtain came down. Art has its price. Bloop though is making a mark. The heart and soul of the event is at Bloop HQ, where you will see various pieces of art, music and technology, whilst Forma café is the space for Bloop's parties and creative workshops. These interactive forums are what the festival is about – accessibility to all. 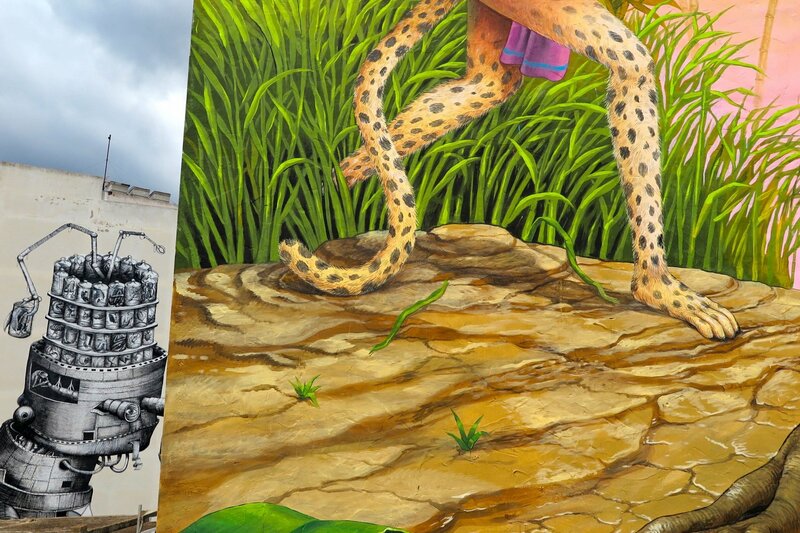 The murals are spreading across the island, with a new one that “connects” the sea to Ibiza Town via a tunnel in a work by Mexican artist Spaik known for interpretations of Latin American folklore and traditions. The hope is that next year more murals be painted in and around Ibiza Town, expanding this project further. In the past editions, the spirit of the mural was played out using a digital wall that simulates real life wall graffiti spraying. The aim is to get people not just appreciating art, but making it; even children get offered free art workshops – it's a ground up type of thing when it comes to art. From the beginning there has been no admission price, no art works for sale and in fact no commercialism. Although Bloop has received funding from San Antonio's Council, the event works on a shoestring with most of the artists offering their work for free. Just the materials alone for a mural might cost €7,000, so evidently the more support the people at Bloop can gain, the better for the future of the festival and for you. Do check out Bloop's website to get a better view of some of their projects past and present and also keep an eye out for next year's festival and the brand new Bloop theme for 2017.